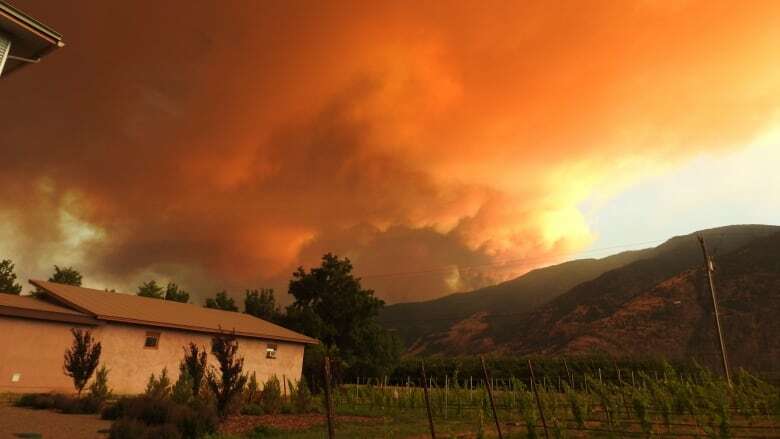 Firefighters are closely watching the weather in B.C. 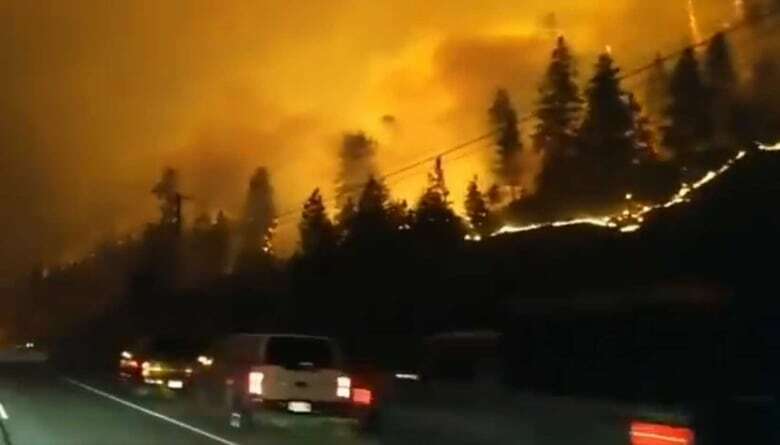 's Okanagan Valley, where several wildfires are continuing to burn out of control and thousands of properties remain under evacuation alerts. Fire information officer Kevin Skrepnek said rain falling in the northern area of the province today is unlikely to reach the fires in the south. "Temperatures are going to be a little cooler ... but unfortunately we are expecting some challenges from the wind today," Skrepnek said Friday morning. Officials said the winds have been grounding air tankers and helicopters working the fire around 6 p.m. most evenings. On Thursday, the Mount Eneas fire grew rapidly to cover 10 square kilometres as strong winds spread the flames. On Friday morning, official estimates put the fire at the same size, but cautioned it was still burning out of control. About 40 firefighters are on the ground. Get updates on wildfires across B.C. At least seven significant wildfires are now burning in the Okanagan Valley, blanketing the region in heavy smoke. The homes of more than 2,000 residents in the region remain under evacuation alert, meaning people must be ready to leave at a moment's notice if conditions worsen. The largest alert is for about 600 properties in Peachland near the Mount Eneas fire, which is the largest in the region. Doug Oggelsby, a Peachland resident under evacuation alert, said he's not used to the fire season because he only moved to the region in December. "It's been pretty scary," Oggelsby said. "Last night, we got the word about 10 o'clock that we were part of the numbers that needed to be on alert to move at any time. "It's very frustrating. You got three kids, a couple of dogs at home, so you're worried about what you're supposed to do. We're not used to it." 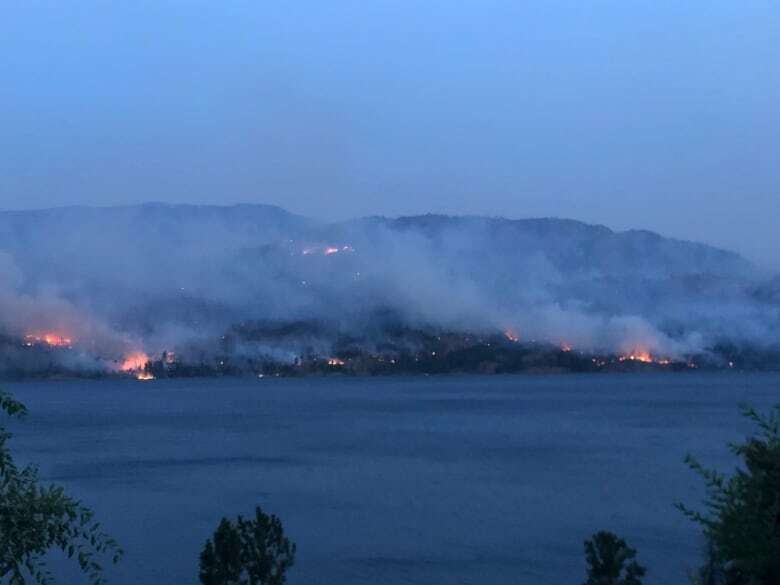 Another evacuation alert was issued around 1 a.m. PT Friday to about of 200 properties in the Glenrosa area of West Kelowna due to the Law Creek wildfire. The B.C. Wildfire Service estimated that fire to measure about eight hectares on Thursday night. Despite the forecasts, there are some signs conditions could be easing. One evacuation order affecting three homes on Log Chute Road was changed to an alert on Friday just before noon, allowing some residents to return to their homes. An evacuation alert for 15 properties at the south end of Lakeshore Road south of the city of Kelowna was rescinded shortly before 5 p.m. on Friday. Campers who were affected by an evacuation order at Okanagan Lake Provincial Park earlier this week will also have access to the campground from noon to 3 p.m. to recover their belongings. They are asked to bring two pieces of identification. The campground will remain closed otherwise. But other local states of emergency and evacuation alerts issued earlier this week for Penticton, Summerland and Kelowna remain in place. The Mount Eneas fire has been burning close to Highway 97, leading to the occasional closure of the main north-south route in the Valley. 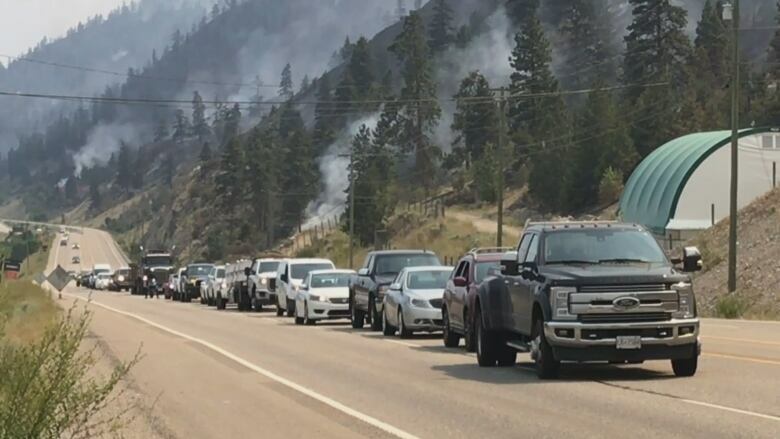 The highway was opened to traffic in both directions on Friday morning around 8 a.m.
All the smoke in the valley has also prompted Environment Canada to issue a smoky skies bulletin for the entire Okanagan Valley. Lakeview Heights Baptist Church in West Kelowna. 399 Power St. in Penticton. Fire information officer Skrepnek said the province will be pulling resources from other areas to help fight the Okanagan fires. "We are moving resources in from elsewhere in the province, from quieter areas where we can free up resources," he said. He added that while things are quite busy now, it's still a far cry from the 2017 fire season, which was the worst wildfire season on record for the province. "We are definitely fully engaged down there but comparing it to where we were at at this time in 2017, [it's] definitely a very different fire season," he said. "You know at this stage last year, the entire city of Williams Lake was evacuated, tens of thousands of people displaced. We had many massive fires burning out of control throughout the Interior." Elsewhere in B.C., there are significant fires burning in the Wycliffe area of the East Kootenay Regional District and the Dog Creek Trail area of the Bulkley-Nechako Regional District. Wildfire evacuation alert issued for rural area near Vanderhoof, B.C. Wildfire centre flooded with calls as lightning sparks flames across B.C.